The alacrity for government spending illustrated by the self-purportedly educated elite in this country displays alarming naiveté and ignorance on fiscal matters. A recent column in the Journal provided a superb example. As my adorable 3-year-old granddaughter Addisyn would say, “Are you kidding me?” Let’s start by turning off the spigot! If your basement is being flooded due to a broken pipe, you don’t start bailing out the water, you first turn off the source and then turn your attention to reducing the water level. Since this administration took power less than 1½ years ago, the Federal Budget has ballooned by over 60%. The yearly deficit has more than quadrupled to $1.2 trillion. The federal debt has grown from $11 trillion to over $13 trillion, and with all the Obama spending promises, that debt will burgeon to $23 trillion in the next ten years, according to the Government Accountability Office. Current debt amounts to $42,000 per American, and over $118,000 per taxpayer. And what do we have to show for all that “wonderful” government spending? A jobless rate hovering around 10%, which Obama promised us wouldn’t go over 8% if the “stimulus” was passed, and a horrible job outlook for the foreseeable future. We have an economy that is statistically out of recession, but the recession mentality is alive and well. The private sector, meantime, refuses to hire new workers not only because of the moribund economy, but because Obama and his facilitators in the Congress have essentially declared an all-out war on the private sector and the regulatory environment is at enmity with economic growth. Obamacare has led to the write-down of billions of dollars by American companies, including $1 billion by AT&T alone. Congress’ penchant for regulation increases the costs of operation for small businesses and large businesses alike, further hampering economic recovery and shooting job creation prospects in the foot. The heralded financial reform recently passed by congress amounts to little more than government control of the financial sector, which banks have already said will impact their bottom line by another 20%. And you thought your bank fees were high before? Where do you think they make up that lost revenue? You pay it! Gratefully the Idaho Constitution prohibits deficit spending, otherwise, judging from the clamor in the public sector, our lawmakers would have been pressured into doing what California, New York, and other states have been doing: maxing out the state credit cards pushing them to the brink of financial ruin. That’s precisely what Obama and his congressional minions are doing. But the laws of fiscal restraint that apply to the rest of us don’t seem to apply to them. If we max out a credit card, not only are we unable to charge any more on it, but we eventually have to pay off the debt accrued by our imprudent and insatiable appetite for spending. Congress, however, can just increase their own spending limits, and continue to charge away. If we as individuals do the same thing as Washington is doing these days, we’re irresponsible. Yet to the statists in our midst, our politicians are to be praised for all that wonderful government spending they do. Which begs the question: why are we held to a higher standard of fiscal responsibility and accountability with our own money than they are with someone else’s? Margaret Thatcher, former British Prime Minister once said, “The problem with socialism is that you eventually run out of other people’s money.” While arguments abound as to whether government takeover of the auto industry, the student loan industry, the health care industry, and the financial services sector constitute socialism, the mentality is more than evident. And who can argue that the politicians in Washington are spending other people’s money? Ours, our children’s, and our grandchildren’s! The president said a few months ago, “It would be a terrible mistake to borrow against our children’s future to pay our way today….” Yet that’s exactly what he’s doing! Didn’t Bernie Madoff just go to prison for doing the same thing? The president is committing multigenerational larceny and funding a federal government Ponzi scheme. Congress has to be recomposed with members who aren’t so cavalier about spending without regard to the ultimate multigenerational cost. Somehow they need their limitless credit cards taken away to prevent them from bankrupting the country. 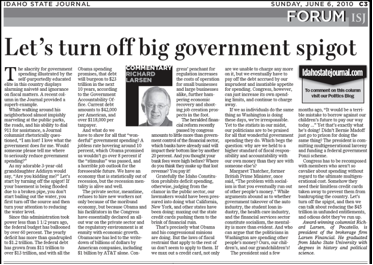 Let’s turn off the spigot, and then we can talk about reducing the $45 trillion in unfunded entitlements, and odious debt they’ve run up.